How cute! hee hee Great sentiment with this HM! You did awesome with the colors and great sketch. Awesome card, America! You are really awesome with the House Mouse images!! You know how to make them come to life!! As always, your card looks BEAUTIFUL!! Oh fun, I love your mouse cards. Love your ribbon, need to try that. I absolutely love this card and I do have this stamp. It's so cute. Love your card! You combined the challenge colours beautifully. This is super cool!!! Love the ribbon treatments on the corners, and you did awesome with these colors!!! 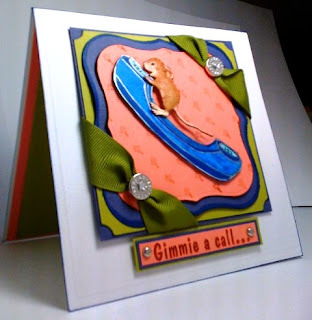 Cute and stylish, beautifully made card.